Bring the hands-on museum experience to your school! If you’re like millions of people all over the country, you’re realizing that field trips just aren’t as practical as they used to be. Unless you have a science museum nearby, your students may miss out on the valuable learning opportunities that only a hands-on museum can provide. This school year, let Mobile Ed bring the science museum to your students with Kidz Science Safari! Not your typical assembly show, Kidz Science Safari consists of a minimum of 12 interactive STEAM exhibits (see the details on the exhibits below) that can be set up in your school. After a brief explanation of all the exhibits, your students are allowed to freely explore the museum throughout the 45-minute session, learning by true hands-on immersion. Best of all, Kidz Science Safari has been designed to be aligned with the elementary science standards for an experience that’s not just fun – it's educational! Over a dozen awesome activities! Programmable Robots that students can get hands-on with as an introduction to coding at the elementary level with line-tracking robots! Airways, a physics demonstration that pushes colorful balls all around a maze of clear tubes that students absolutely love. Bike Generator that enables kids to convert their potential energy into electrical energy by illuminating a tall tower of light! 3D Printing shows your students the exciting world of desktop prototyping and manufacturing that is literally changing our world! Gravity Wall where students create a pathway of twists and turns and then test their design using small balls and the force of gravity. Magnetism employs several ball bearings drawn by magnets to travel through a maze along with a cartoon portrait that the kid’s apply the “hair, moustache and beard” to by using a magnet and iron filings. Domino Race is just that –an area where kids set up dominos in patterns, going up and down “steps” and then with a push – send the dominos crashing into each other while all the time learning about engineering, motion and force. Giant Microscope allows the students to examine a nice collection of bugs, flowers, feathers — and any other object they’d like to see “up close” – on a large 21″ screen. Plasma Ball demonstrates an invention of Tesla as well as one of the states of matter. Conductivity has the students compete to see who can complete the course without closing the circuit and lighting the light. Bernoulli Exhibit demonstrates air pressure in a wonderful, yet simple activity. Geometric Shapes has the student create anything from letters to numbers to trapezoids, squares, triangles – whatever they choose- using jersey loops on a really large pegboard. Dino Dig with dinosaur bones, claws and teeth that simulates the search for fossils. More exhibits are being developed all the time! 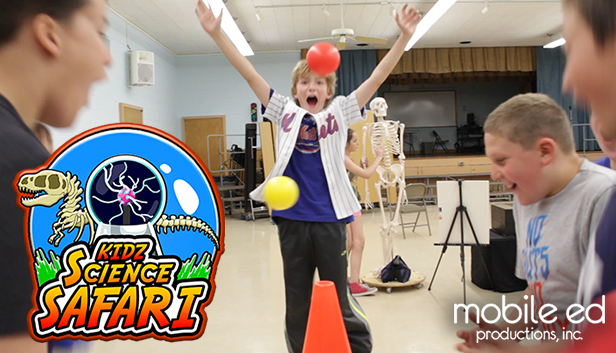 Hands-on STEAM fun for everyone at Kidz Science Safari! The modular nature of this program makes it suitable for any venue or special event. Number of Sessions 1-6 sessions per day. Additional sessions (up to 8) available for an additional fee. *Not all exhibits may be available on the day of your show. Kidz Science Safari is an amazing value for your school assembly dollar, bringing all the fun and excitement of going on a field trip without any of the hassle. Subscribe to receive notifications from our blog!